Polar Bears For Kids | Cool Kid Facts . Polar bears, also known as Ursus maritimus by their scientific name, are the largest carnivore that lives on land in the Arctic. Even though we might think so, they don’t live with the super cool penguins, which actually live in Antarctica. 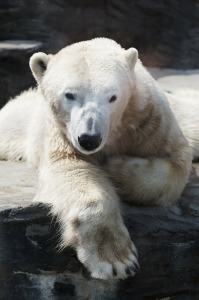 Let’s explore some polar bear facts! Where are Polar Bears found? There are five countries that are lucky to have polar bears and they are the United States, Canada, Russia, Greenland and Norway. They’ve got some pretty cool names that people refer to them by including obviously Polar Bears but others are Sea Bears, White Bears or Beliy Medved in Russia, Isbjorn inDenmark, Lord of the Arctic, Ice Bear or Nanuk to the Inuits which means an animal worthy of great respect. Which one will you call the Polar Bear? Sadly they are on the Vulnerable List of endangered species. How do they hunt for food? 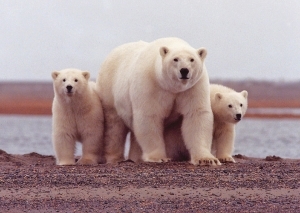 They are very big and powerful, white bears. Some scientists think that they started to evolve about five million years ago from brown bear ancestors. That is one seriously long time ago! They are brilliantly adapted for survival in their icy homes and hunt seals in openings on the ice, called leads, or at breathing holes. They wait silently for hours or days for seals to come to the surface. If one bear ‘owns’ a large carcass, it might share it if the guests approach low-to-the-ground, circle the carcass slowly and touch the nose of the bear in charge. How interesting is that…they need to do a dance for some food! A polar bear can also hunt by swimming beneath the ice. They mostly eat seal blubber because of its high fat content but sometimes eat walruses, beached whales and if stranded on land, vegetation, geese, bird eggs and occasionally caribou. They can survive for seven to ten days without food. How large are polar bears? An adult male normally weighs between 775-1,200 pounds (351-546 kilograms). The largest polar bear ever recorded weighed 2,209 pounds (over 1,000 kilograms), which is about the same as an average car. That’s unbelievable! Adult females weigh about 330-650 pounds (150-295 kilograms). Excellent sight and hearing and are very intelligent. Females usually have two cubs that stay with their mother for about two and a half years, learning to hunt and survive. Polar Bears don’t hibernate, but mother bears live in dens to raise their cubs where they don’t eat or drink during that time. How do Polar Bears Communicate? 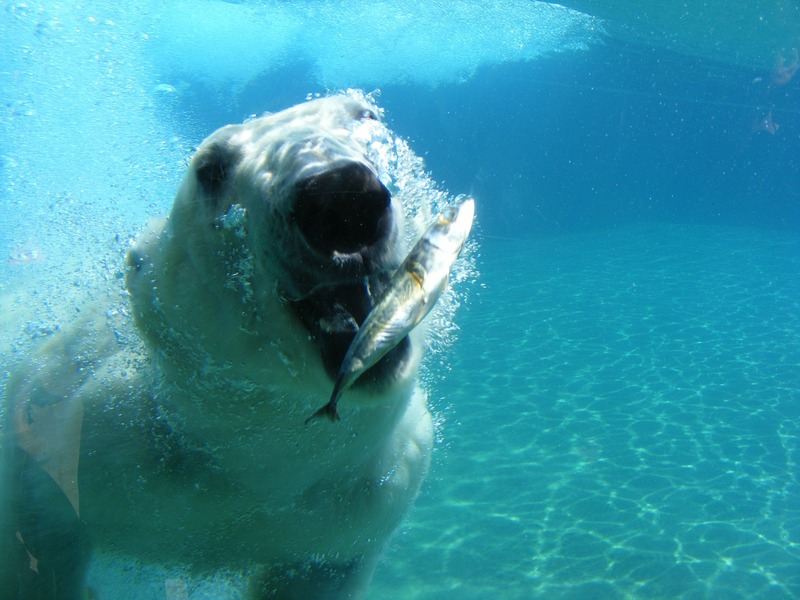 Polar Bears use body language and vocal sounds to have a chat to each other. They sway their heads from side-to-side when they want to play; make chuffing sounds when stressed; loud roars, hisses or growls when they’re angry and deep growls when they’re defending food; they attack with lowered heads and ears laid back and move downwind to show submission. Are Polar Bears Actually White? 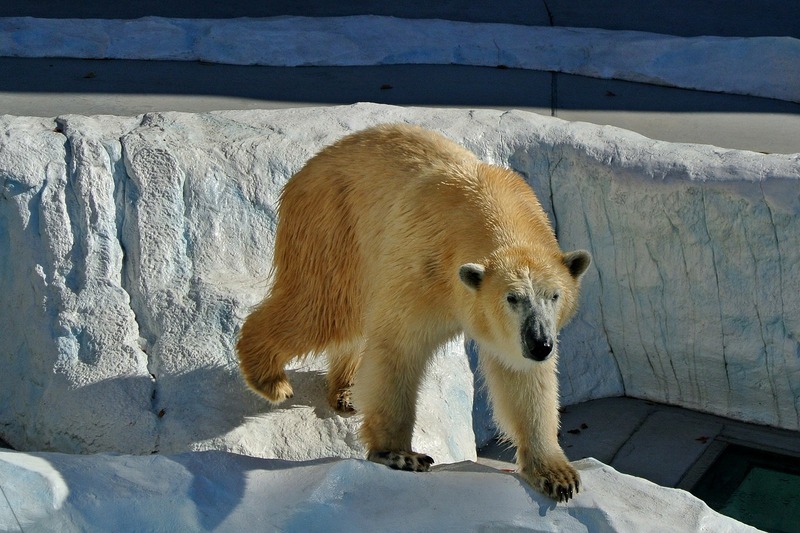 Although Polar Bears appear white, their fur is actually transparent, and has a hollow core. It looks white because it reflects visible light. Under their fur, polar bear skin is actually black with a layer of fat about 4.5 inches (11.5 centimeters) thick to keep them warm under water. Mother bears are reluctant to swim with young cubs during cold spring temperatures as the cubs don’t have enough fat to keep warm; it’s their dry fur that keeps them warm. 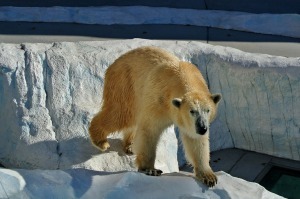 Polar bears look whitest when they are clean and in sunlight. Before molting, oils from the seals they eat can make them look yellow. In San Diego Zoo in 1979 polar bears turned green because of algae growing in their hollow hair shafts. Luckily they turned white again with the zoo fixing and algae. Biologists gather information about Polar Bears by fitting them with plastic belting tracking collars. They stay flexible in cold temperatures. Nowadays GPS is used to track them and is accurate within 30 feet (10 meters). Most collars are fitted with an automatic release mechanism and a clock set to drop off on a specific date. Collars don’t interfere with the bear’s natural activities. Bears can be followed for a long time to learn about their movements, hunting patterns, distances moved, time spent on land and in the water, use of habitat and survival of cubs. Now aren’t these just the coolest animals around? Hope you’ve learnt some cool stuff about Polar Bears!